For the first two episodes of Comedy Bang! Bang!, the show brought out some of the greatest comedians possible as guests, with Zach Galifianakis and Amy Poehler taking the couch next to Scott Aukerman. In the third episode, “Jon Hamm Wears a Light Blue Shirt & Silver Watch,” Hamm showcases his comedic side. However, this third episode doesn’t feel quite as strong as the previous two due to a few skits that don’t really resonate as well as they did in prior episodes. The episode starts out with Peter the Meter Reader testing Aukerman to see what the tone of the episode will be, followed by Aukerman going to a viewer’s home to surprise them. When he arrives, Andy Richter is just leaving the house, clearly stealing a toaster. Both bits are okay but never really bring any large laughs to the proceedings. The first guest is of course Hamm, who is always great on the podcast and while he may not be the most vocal guest, when he does say something, it’s usually surprisingly brilliant. I never really felt that here in his interview, although there are some great moments, such as when Scott shows a clip from early on in Jon Hamm’s career, which turns out to be a clip from quite possibly the newest Mad Men episode they could get. But when Scott turns the cameras over to Niles, a student filmmaker, then leaving Scott to show him how it’s done, the jokes don’t really work that strongly either. Thankfully the second guest of the episode is El Chupacabra, played by the always great Nick Kroll. His character is a Spanish language DJ who does a variety of voices, such as Baby, and also shows off his ideas for selling different products, like Craigslist, Sun Chips and pajamas. It’s a strange character to be sure, but Kroll pulls it off with every line. Having Kroll saying ridiculous things then having Hamm translate for Aukerman is a great idea and provides some of the biggest highlights for the night. The rest of the episode gets into some weird territory that is pretty hit-or-miss, like a dog that arrives on set to warn Aukerman about Timmy who has fallen into a well. Turns out the dog pushed Timmy and it was a hate crime, leading the dog to get a dog lawyer, played by Brett Gelman. Gelman is fine and instantly creepy with the ponytail he started growing after seeing Avatar, but once again the skit doesn’t work as well as hoped. The whole episode hits a peak of weirdness when the final guest, Francis Domingo, portrayed by Leo Allen, arrives on the set. Domingo is a man who eats bicycles out of necessity. Aukerman tries to feed Domingo Reggie Watts’ bike, but Watts starts speaking jive to them, which Hamm also translates, leaving Domingo without a bike to eat. Aukerman ends the show with a new segment called “Maybe It’s Just Me But For Me…” to which he talks about how he thinks The Beatles may have been one of the greatest rock bands and how he believes that roller coasters should have drops and turns. It’s right in Aukerman’s style of humor, but it never really works as well as it should. 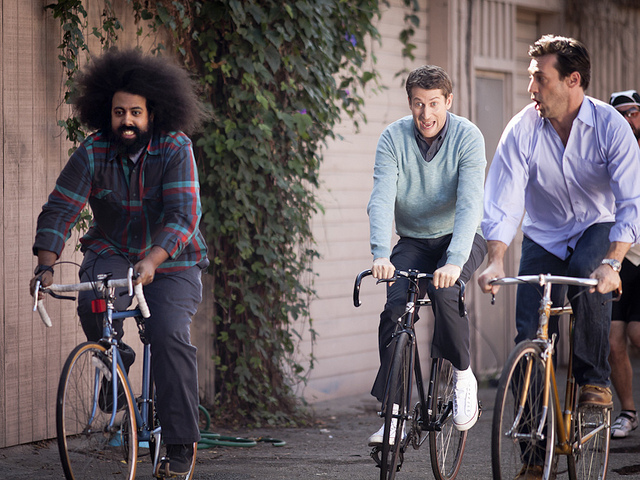 As Watts, Aukerman and Hamm leave the set on their bicycles, Domingo chases after them, ready to eat their bikes. Combining the comedic talents of Aukerman, Hamm and Kroll should have been more amusing than it ended up being. Instead of the tangents that have worked in previous episodes, this episode might have benefited from focusing on the improv between this great trio. But with an episode that is about half skits that don’t work all the way, the show does drag a bit. Like the podcast itself, sometimes the show can work at its best without the characters and skits, but rather by allowing the guests to play around and see what works, because with such freedom, the humor usually comes quite naturally and even better than expected.